It’s pretty rare to find someone [at least in my generation] who doesn’t get the reference, “You’re killing me, Smalls.” And if they do give you a quizzical look, well then they probably deserve the Scotty Smalls comparison. The Great Bambi?! Anyway. My point is “The Sandlot” may not have won Best Picture in 1993, but from my comedy-loving, film-novice standpoint, it’s a classic. Bunch of ragtag kids playing America’s game, trash talking crosstown rivals, talking to specter Babe Ruth and taming James Earl Jones’ scary dog. Who doesn’t get chills hearing, “Heroes get remembered, but legends never die”? And what prepubescent boy didn’t dream of having cajones big enough to pull a Squints and kiss the hot lifeguard at the pool? I’ll bet you knew about s’mores before you saw Sandlot, but it’s hard to put one together without recounting the treehouse scene in which Squints lays out the “s’more stuff” and demonstrates proper construction techniques. When it came time for me to choose a dessert to make for my fantasy baseball draft last weekend, I thought s’more cookies was an apropos (albeit, slightly contrived) offering. When the boys made the connection, I heard, “It’s nice to have a woman’s touch in this league.” They probably would have said that even if I brought some box mix cookies, but hey, whatever. Preheat oven to 325 degrees. Sift together flour, baking soda and salt. In mixing bowl, cream together butter and sugars until fluffy. Beat in egg, egg white and vanilla. Slowly mix in dry ingredients until just combined. Fold in chocolate chips and graham cracker crumbs. Drop tablespoons of dough on parchment paper-lined baking sheet. Bake 8-10 minutes, and remove from oven. 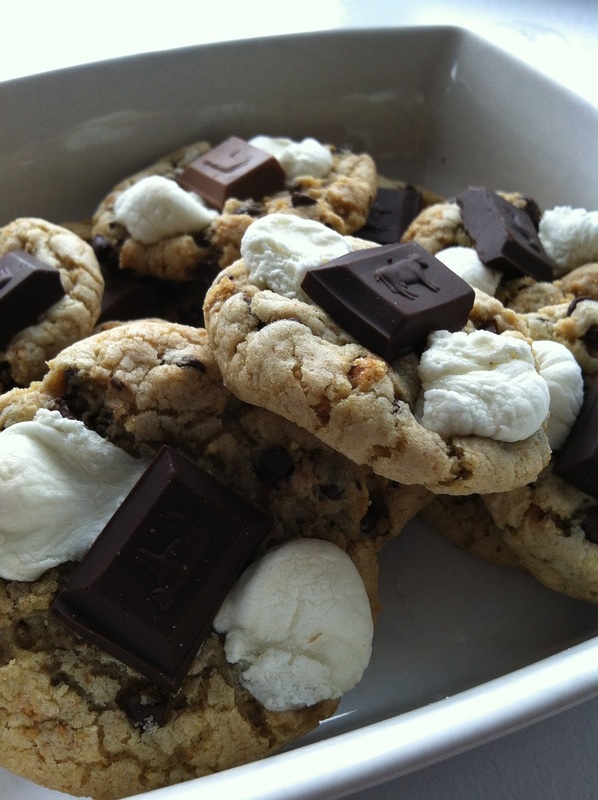 Press one small square of chocolate and a few marshmallows into each cookie. Bake for 3 more minutes. Remove from oven and let stand for 10 minutes. Transfer for wire rack to cool completely (or steal a bite of a hot, melty, delicious cookie). Calories? 76 calories per serving (based on approx. 40 cookies made). Total time? 30 minutes prep and bake. Overall success relative to expectations? 10 out 10. These cookies were soft and delicious, packed with a little bit of s’more stuff in each bite. They were most delicious fresh out of the oven, which can be easily recreated by a few seconds in the microwave. My fellow fantasy baseball managers obliterated the plate of these before the sixth round, so I take it they were a success. I’m not a big sweets girl, but I absolutely loved these. I’d eat them — dare I say? — FOR. EV. ER. FOR. EV. ERRRRR.